​Shaldon Water carnival, held on the 1st Saturday in August each year is only one of four events organised by the Shaldon Water Carnival Committee. This page provides a brief overview of the events and of opportunities for advertising in the programme, getting involved or applying for a small grant out of the funds raised by the events. Full details of events will be published on Facebook - so click below to join the group and keep up to date..
A time to get together with friends, to celebrate our great community an evening for our committee to let down their hair before Christmas joviality and our Boxing Day 3-Legged Run! The role of the Marshal is to keep the crowds back during the procession and help to ensure the Carnival procession runs as smoothly as possible. Collectors are vitally important at all of our events. The role of a Collector is to collect donations made by the public towards the Water Carnival. Anyone is able to collect and we appreciate as much or as little help you feel you can offer. The Water Carnival may be a one day event; however, a lot of work goes into organising it. We are always looking for enthusiastic people to help us prepare for the Carnival (anything from putting up gazebos to making tea and coffee). We have an awful lot of work and anyone can help out. A major part of the Carnival’s success is the unstinting and continued support of Shaldon's residents and businesses, from sponsorship or advertising to funding events, raffle prizes and donations. 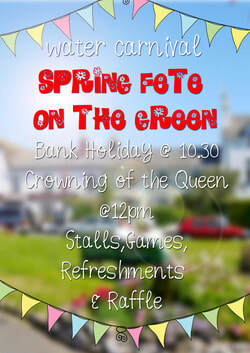 There are many ways that local businesses and individuals can contribute to Shaldon Water Carnival. 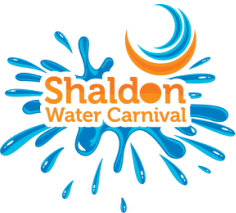 Shaldon Water Carnival attracts excellent publicity and press in the run up to Carnival Day so you can share in this by helping to sponsor us. Sponsor a game / event on Carnival day - If you sponsor an event or a game on Carnival Day outright, you will receive full credit in the Carnival programme and in any event publicity we do before and during Carnival Day, plus your name will be displayed on any entry/application forms and at the site of the event/game. Contribute towards an event / carnival expenses - If you do not wish to sponsor a whole event, we are equally grateful for smaller cash donations. We will have a page in the programme and a page on the website dedicated to supporters of Carnival. Sponsor our t-shirts - Crew t-shirts are worn at each event by the committee. 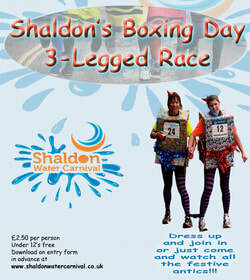 Sponsor our t-shirts and your name will be printed on the back of the t-shirt. We are happy to take multiple sponsors for this. Donate a prize - If you would prefer to give a prize it will be used in one of the raffles held throughout the week. 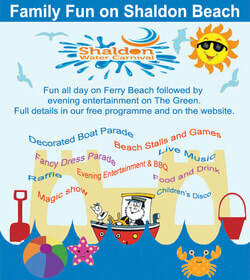 Advertise in our Carnival Day programme - Prior to the Carnival, every house in Shaldon will receive a programme through the door free of charge. The remainder are available at local venues and shops for visitors to the town.